Mongolia! Mongo-liah! Ah! Mon-go-li-ahhh! The rally finally begins in earnest. Those of you that have run a a marathon know that at 21 miles you’re halfway to finishing the 26.2 mile race. The Mongol Rally is no different. We knew there were no roads, no signs, no means of getting to Ulaanbaatar other than on our own. Yet, nothing really prepares you for a week-long drive at 20 mph in the most incredibly beautiful scenery imaginable. But more on that later. Carefully making our way down the rocky, pothole strewn pass towards Tsaaganuur, one particular motorcyclist made himself known by flashing a Christina Noble Children’s Foundation (the official Mongol Rally charity) t-shirt at us. Temujin followed us and eventually we gave into his spirited entrepreneurialism and agreed to join him for dinner, besides it had been some 24 hours since we’d eaten and we were starving. Almost as soon as we sat down with his “I Love You”, a head of mutton was produced and Temujin proceeded to carve it up for us as we hungrily dived in. Hygiene, like asphalt, is a thing of the past now. Horse, camel and goat cheeses, traditional breads and hearty broth complemented the meat. Grandpa and Grandma welcomed us and after dinner we were joined by the archetypal disco-dancing drunken brother and his young son, then later by the sober, sensible brother who worked for the army, along with his fetching wife and their new son. 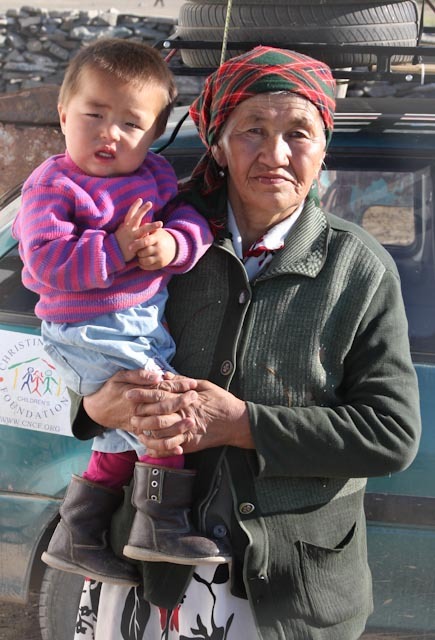 The circle of Mongolian family life was completed the next morning as we watched the goats being milked. Our version of couch surfing was for us a perfect introduction to this vast, empty country. Temujin gave us directions and recommendations on what and who to avoid along our route. He reassured us that Swifty’s new Barum tires would reach Ulaanbaatar and so far they’re holding out.